A near-perfect cast of a right bronchial tree coughed up by a patient experiencing internal bleeding related to anticoagulants administered during treatment of heart failure. 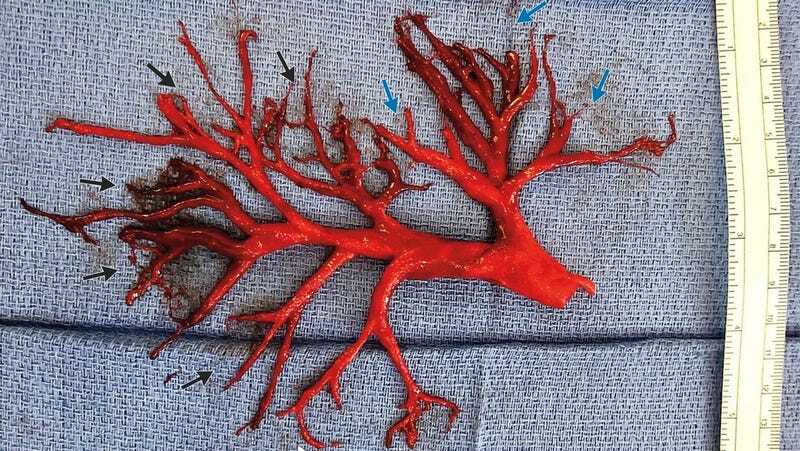 Though it resembles a coral, root system, or some other kind of growth, the above photo actually depicts a six-inch-wide blood clot in the near-perfect form of the right bronchial tree of a human lung, the Atlantic reported on Thursday. Even more uncomfortable is the revelation that it was not removed by medical staff, but in fact coughed up by a patient who was suffering from heart failure. An Impella ventricular assist device was placed for management of acute heart failure, and a continuous heparin infusion was initiated for systemic anticoagulation. During the next week, the patient had episodes of small-volume hemoptysis, increasing respiratory distress, and increasing use of supplemental oxygen (up to 20 liters delivered through a high-flow nasal cannula). During an extreme bout of coughing, the patient spontaneously expectorated an intact cast of the right bronchial tree. Once Wieselthaler and his team carefully unfurled the bundle and laid it out, they found that the architecture of the airways had been retained so perfectly that they were able to identify it as the right bronchial tree based solely on the number of branches and their alignment. Wieselthaler added that one possible way the clot could have remained intact, rather than be broken up, was a high concentration of fibrinogen, a protein in blood plasma that helps form clots. The patient had an infection that both aggravated the heart failure and may have caused a buildup of fibrinogen in the blood, resulting in a more rubbery clot, he told the Atlantic. It might seem a little like rubbernecking to gawk at the product of someone’s medical misfortune, but even most doctors may never have the chance to see something like this. Though there are other conditions which can result in bronchial casts, including infections and asthmatic conditions or lymphatic-flow disorders that can cause buildups of mucus or lymph fluid respectively, Wieselthaler was emphatic that the size of this one is almost unprecedented. Update: 12/7/2018, 6:25 p.m. ET: Updated with comment, as well as with additional context.